Today is Mother’s Day here in the U.S., and there’s no better time to honor the most loving, generous, and delightful woman in my life: Mom! She is a gift from God, and I learn more about grace each year just being her daughter. She is divine. I am thrilled to call her Mom. Putting her six children first in her life gave Mom little time to dabble in the garden in years past, but she knows a good plant when she sees one! We’ve had the pleasure of touring some gorgeous homes and gardens together, here and in Europe. 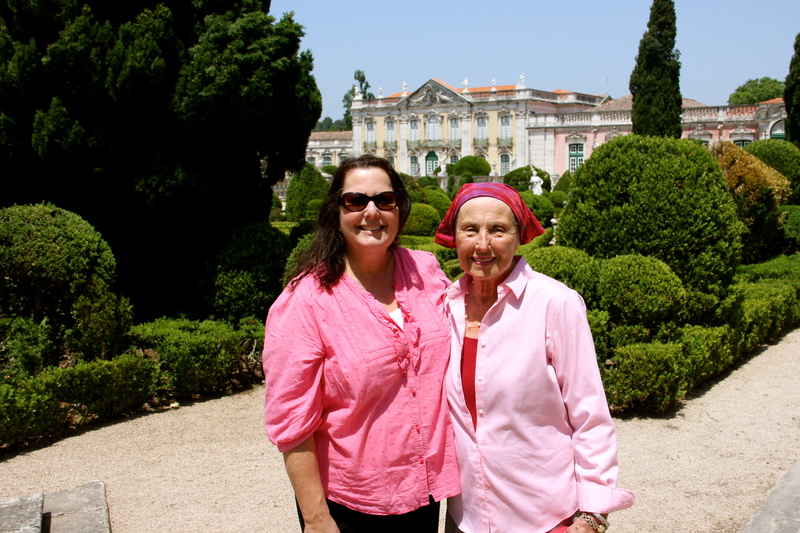 This was in 2012 at Queluz Palace in Lisbon. Four growing things always remind me of Mom: gardenias (her favorite flower), wheat (pictured on her fine china), pomegranates (we share a fascination), and grapevines. Mom is an inspirational woman of abiding and sustaining faith, and the grapevine is a Christian motif. “I am the vine; you are the branches” are words of Jesus in the Gospel of John. As we remain in The Vine, we bear fruit. Similarly, I believe that as we grow in Mom’s love, we can’t help but be fruitful. On this day, in between all the family fun and phone calls filled with love, I’ve walked through my gardens and taken photos of beautiful vines. 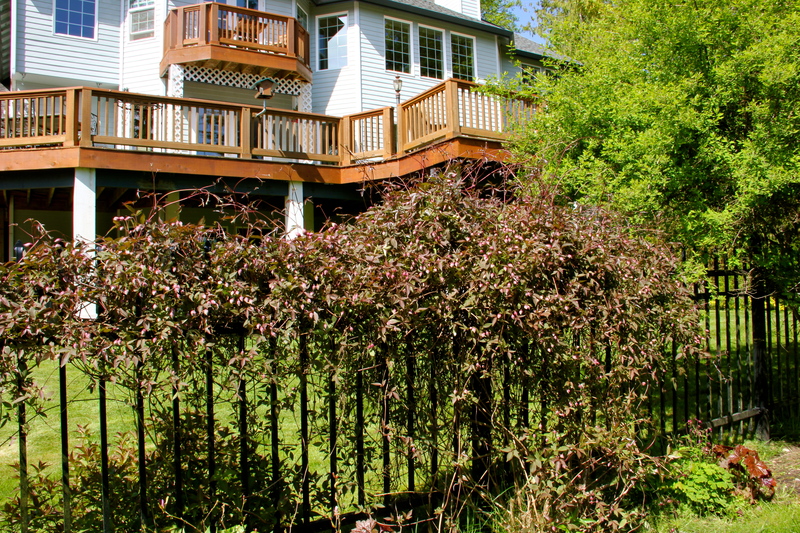 Climbing vines, like trees and tall bushes in the landscape, add the important element of height here at Coppertop. 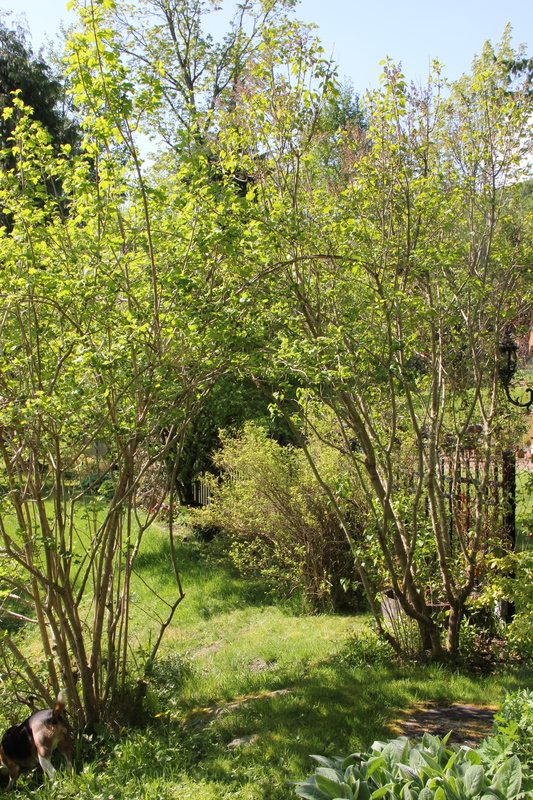 I appreciate the skill with which the previous owners planned then trained arches and trellises throughout these gardens. The arches in particular beckon and encourage wandering. 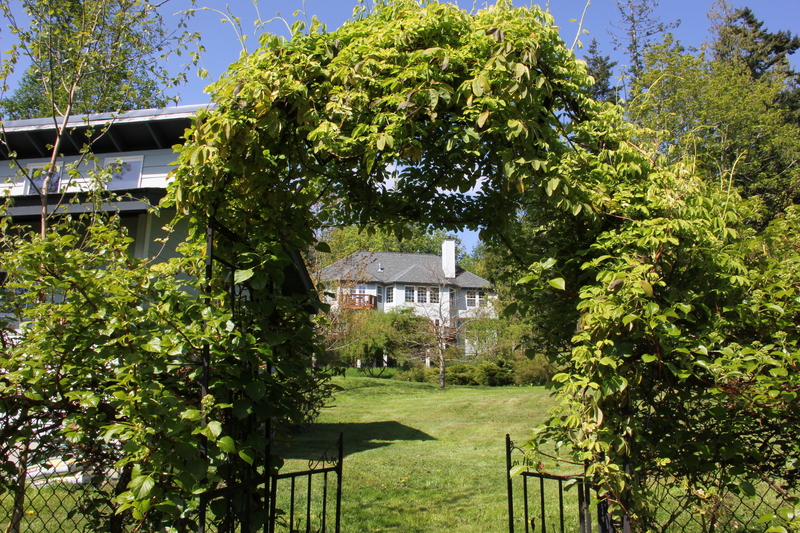 One of my favorites is this area leading into the vegetable garden, which is framed by two climbing hydrangeas and a chocolate vine or Akebia quinata. When these bloom it will be wondrous. Makes me sing as I walk through to do watering and weeding! Another favorite viney area is the one I call the black arches. 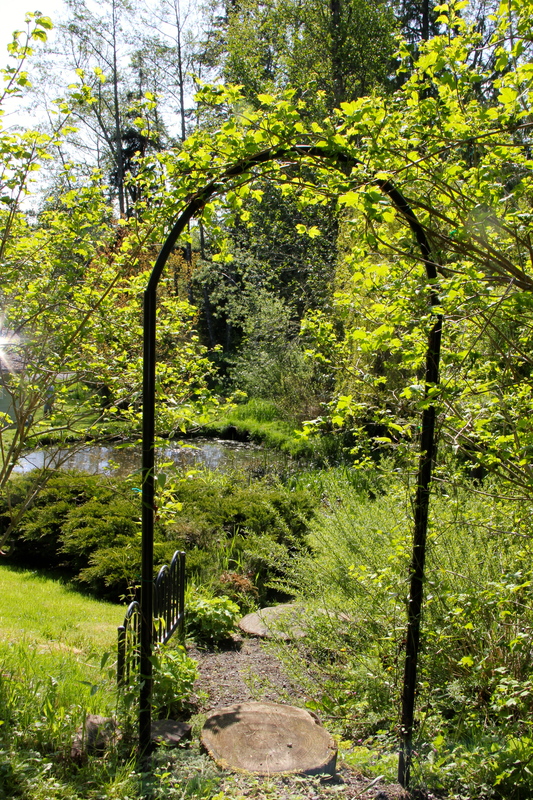 We remember the lush vines climbing these arches when we visited the house last fall. 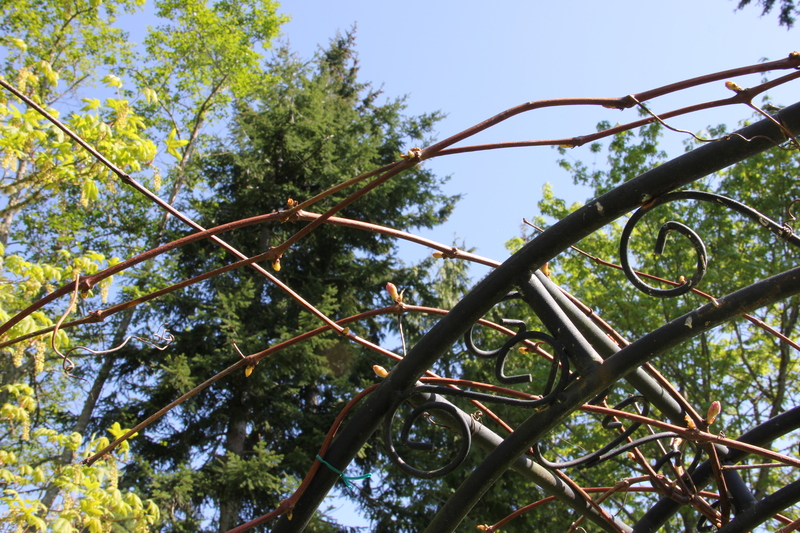 At this point in mid-spring, the vines are climbing but not yet blooming. Here grow a selection of young hydrangeas, hardy kiwi, hops, Virginia creeper, and clematis, as well as a couple I don’t yet recognize. I attempted to grow two deep purple clematis Jackmanii against a fence in Virginia, but a combination of super-hot spring temps and a rambunctious puppy were their downfall. They barely lasted a month and didn’t return the following year. 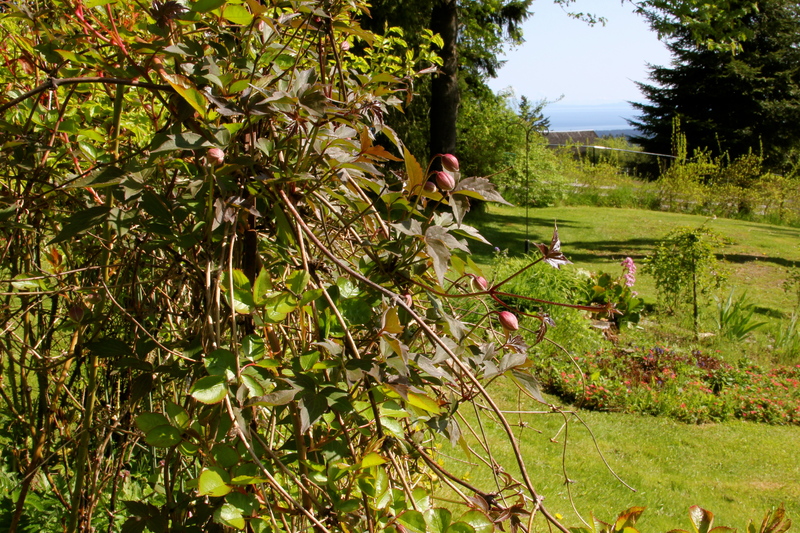 Today I began counting the established clematis vines at Coppertop and stopped when I reached ten. One of the most spectacular is this one outside the home’s ground floor. 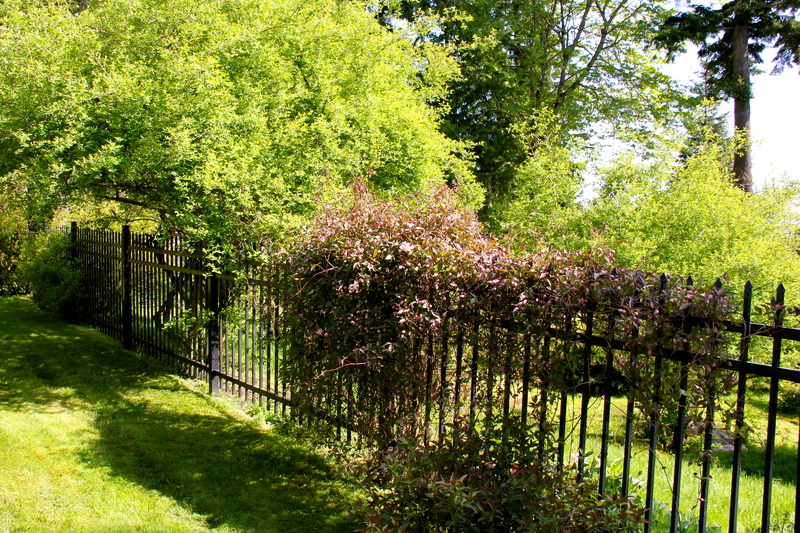 It grows beautifully along a low black fence which delineates a flat lawn expanse from a hill and the stream. 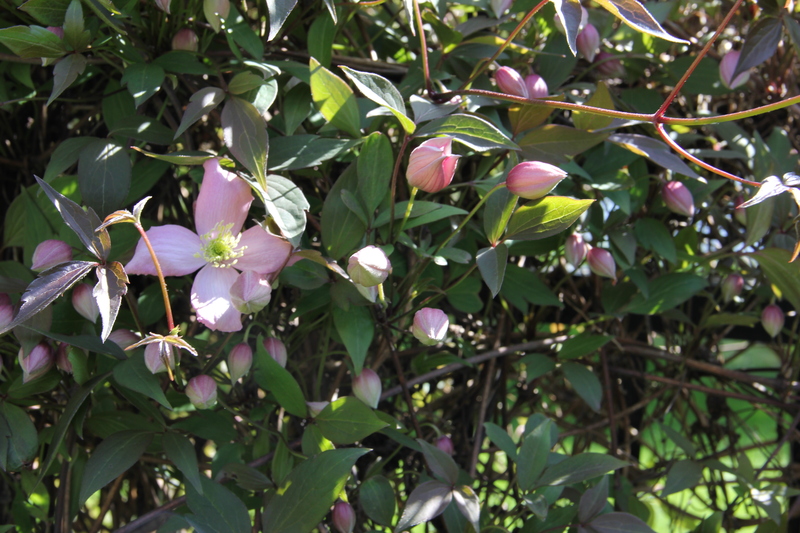 Today the first pale pink blooms opened. We also have a few climbing roses. All roses in these gardens seem behind in development, so perhaps we’ll have blossoms next month. I’m excited to see what colors and fragrances are in store, and I’ll be sure to share. 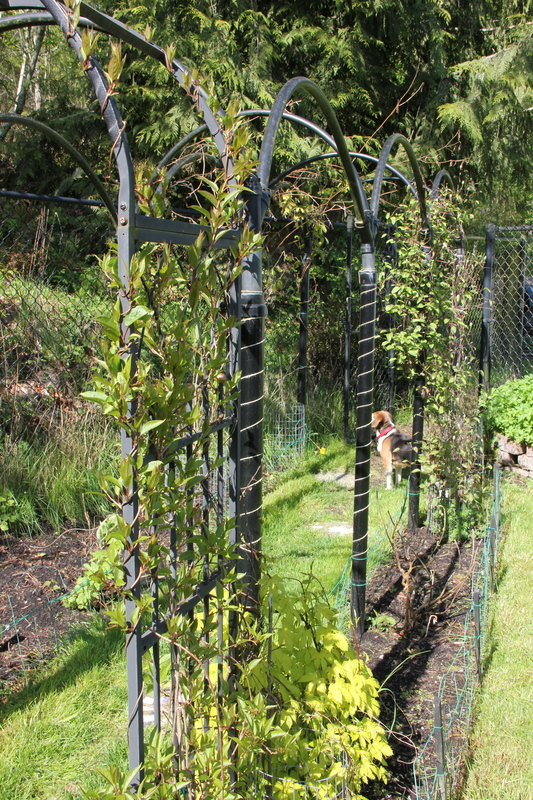 Finally, near the perennial beds are lovely vines and archways coming to life which are composed of clematis, lilac bushes, more roses, and some climbers I don’t recognize. SO much more beauty to come. 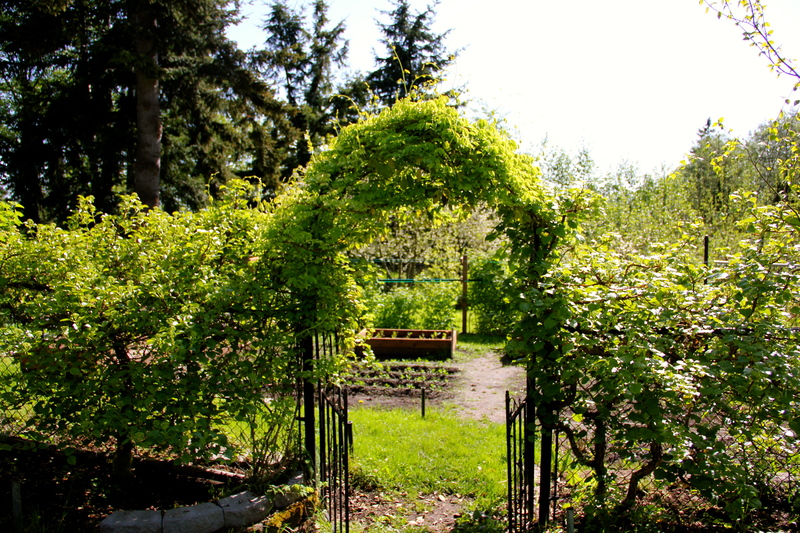 This entry was tagged akebia, clematis, climbing hydrangea, climbing roses, Coppertop, gardening, hops, Mother's Day, Olympic Peninsula, Queluz, vines. Bookmark the permalink.